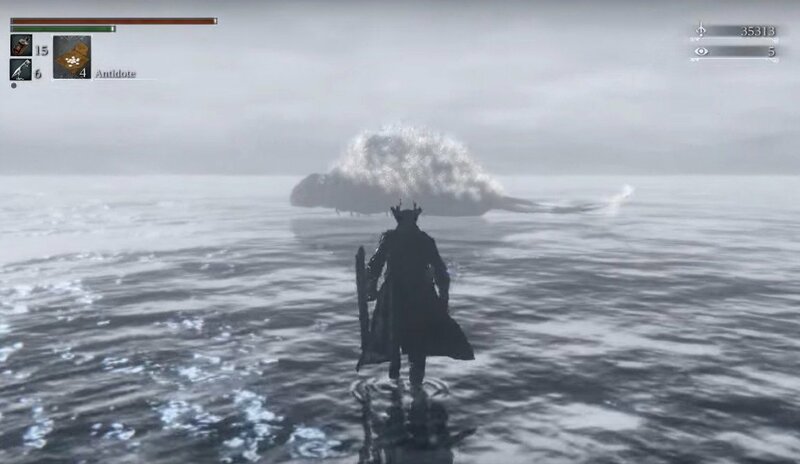 Byrgenwerth is a location in Bloodborne. 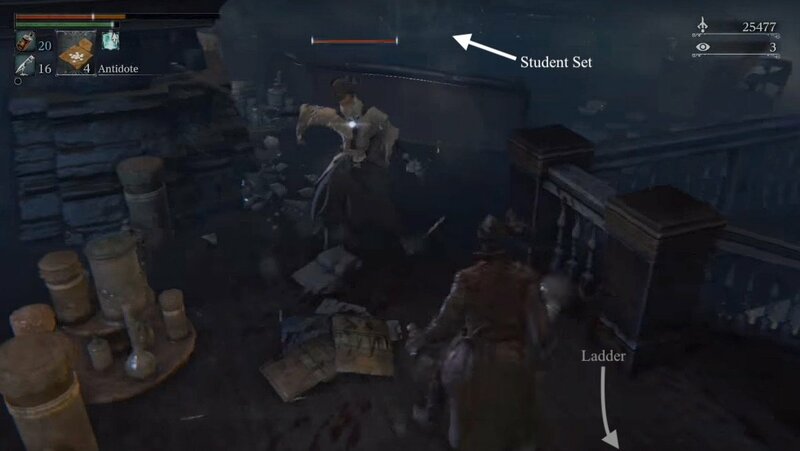 It is a former building for higher education, discovered immediately after the Shadow of Yharnam boss fight. Go ahead a short distance, fight one enemy, and you arrive at the Lamp. "When the red moon hangs low, the line between man and beast is blurred. And when the Great Ones descend, a womb will be blessed with child. Location: On a Bookshelf on the same floor as the Lunarium Key door. "The spider hides all manner of rituals, certain to reveal nothing, for true enlightenment need not be shared." Location: On a couch on the opposite side of the same floor as the first note. The moon here never turns orange. There appears to be a trapdoor built into the floor of the building's lowest level. A chain worked into a small pulley on one side runs over the top of the door, precluding access. Many of the breakable containers inside the college contain eyeballs and a greyish liquid. 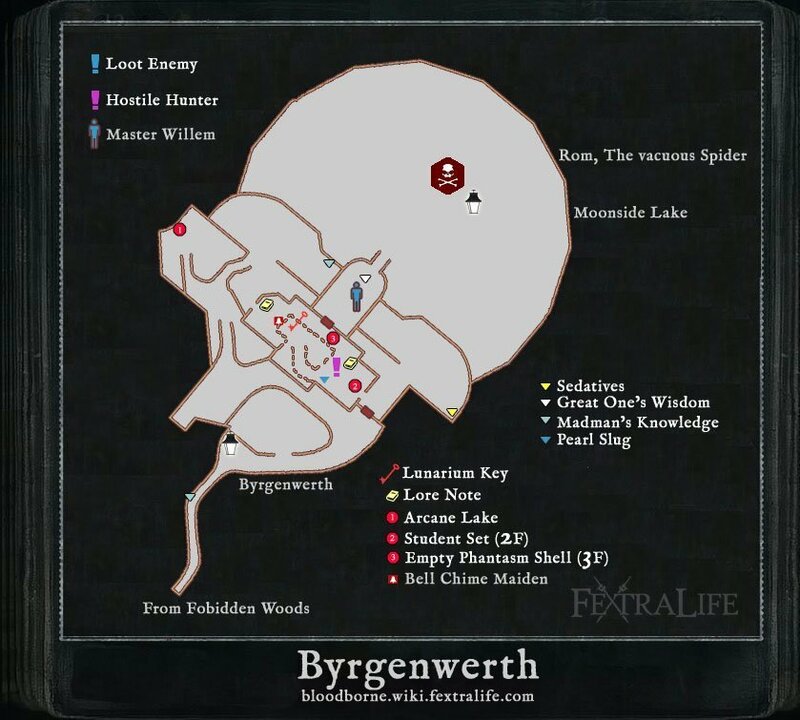 Bygernwerth is an area situated directly past the Shadow of Yharnam boss fight in Forbidden Woods. From the Forbidden Grave Lamp, head away from the Woods though an arched doorway into a narrow wooded tunnel. Keep an eye out for an ambush by a Mi-Go that is hiding behind some trees on your right at the end of the tunnel. There will also be a corpse with a Madman's Knowledge to your left. 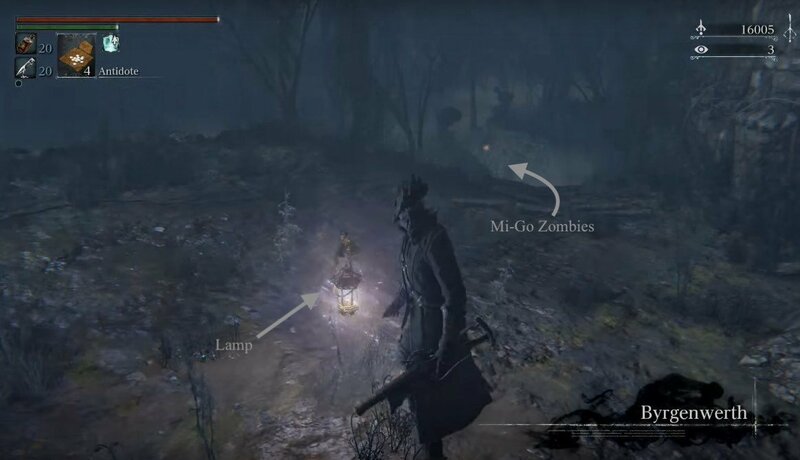 After you exit the wood path the Byrgenwerth Lamp will be directly in front of you. If you head down the stairs on the right, there are 3 more Mi-Go Zombies in this area. Take the first one you see down here. Head left and wait for the one patrolling to move away from the tree on the left, then head there and kill the second then finally go over and kill the last one. It is better to try and pull them one at a time and avoid their flying jump/grab since it will induce frenzy. Keep some Sedatives handy. After this, head up a small stairwell to the right, sticking to the left wall to ascend a small stonewalled path and some stairs into a clearing with a tree in the center. There is a Brainsucker behind the tree. Dispatch it carefully and then pick up the Arcane Lake near it. The gate at the bottom of that first stairwell is shut for now but can be opened up to provide a shortcut later. Run back out of the clearing the way you came and down the steps further. You should find yourself in a courtyard, next to another closed door on the side of a building. Head to the left of it, down towards the lake. Head down the central path under the bridge on this side of the building, being careful of the Celestial Centipede on the other side that may throw some fireballs at you. Pick up another Madman's Knowledge on your left which will trigger 2 more Zombies dropping down from the bridge above. Pull them back away from the Centipede and take them out. Once they're taken care of head back to the Centipede, making sure to dodge its fireballs. Get behind it and just wail on it 'til it goes down; it is also susceptible to poison, so you may want to use Poison Knifes if you have any. Underneath the balcony on the left hand side you can find a Great One's Wisdom. Be careful, because there is yet another Zombie on the far side of the circular rotunda that the Centipede occupied. Also pick up x5 Sedative on the far side of the rotunda where it was hanging out. You should now head back towards the house on this side. You will see the other side of the gate by the Lamp and the lever to open it. There is also an open door leading into the building. Pull the lever and head into the building. This hunter is a fairly difficult fight. She wields a Threaded Cane and a Rosmarinus and can also use an Augur of Ebrietas (tentacles shoot from her hand), and A Call Beyond (star explosion of magic, very annoying to dodge). Generally trying to stick close to her to bait a cane/whip attack and then dodging around her seems to discourage the magic attacks, but be warned that she can hit for a lot of damage. The stairwell can be used mostly reliably to avoid the star explosion attack, but her whip can hit you through it. It is possible to parry her, however the window for a parry is so narrow that unless your timing is impeccable, chances are you'll still take damage. The main issue with this fight is that there is the lack of open ground to fight on. The furniture and layout of the house means that you can be cornered very quickly. You can always run over and open the far door before she engages you and pull her outside for more room to maneuver. 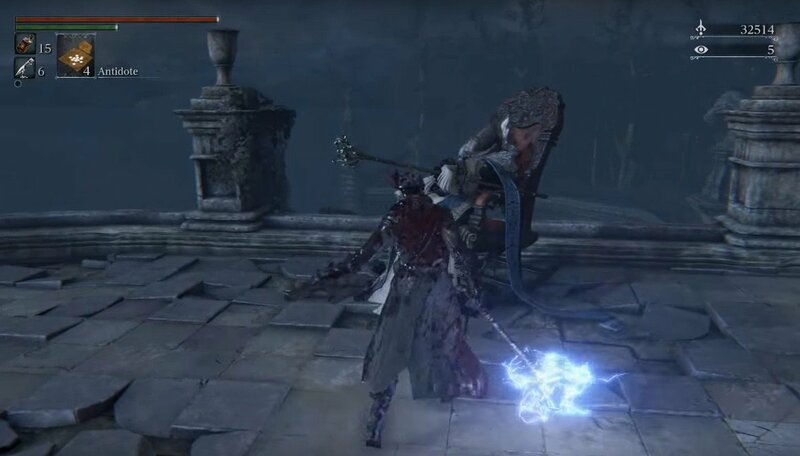 This NPC fight can also be initiated with a visceral backstab for some free damage. Go to the bottom of the staircase to trigger her, then back off and hide out of sight. She will walk down the stairs, turn around, and go back up again. When you sneak back up the stairs she will be standing in front of a chest with her back against you. Once the hunter is dead, you'll be granted 3x Blue Elixir, and you can open the (fairly useless) shortcut door on the other side of the room and safely head up the stairwell to the second floor. Straight ahead in the little sitting area is another chest with the Student Set in it. Heading back past the stair and around there is a door to the right that is currently locked (this is the door that leads to the boss fight) and then further on there is a note to read on a bookshelf. All the way around is a ladder leading up to the third floor that you should climb now. The loot on the table immediately in front of you as you climb off the ladder is the Lunarium Key, which unlocks the boss door on the floor below that you just passed. But before continuing on to fight the boss, head up another flight of curved stairs to a little landing. This landing will probably be empty now, but it is where the Chime Maiden who rings the sinister bell will spawn when playing co-op/PvP. Head up yet another curved stairwell to the very top floor and watch out for a Zombie ambush from behind you. Open the chest up here to receive an Empty Phantasm Shell and then head back downstairs to the second floor. Open the locked door and head out onto the balcony to meet Master Willem and engage in deeply profound conversation with him. Talking to him nets you 2 Insight and killing him (no real reason not to) grants you the Eye. After you're done chatting/murdering, head to the far end of the balcony and hop off into the lake. BOSS FIGHT: Rom, the Vacuous Spider. Note: If you have the League of Confederates patch and have acquired the Old Hunter Bell, then there is a summonable old Hunter called Mensis Scholar Damian. His summon location is right next to balcony door. He is very similar to Micolash in terms of fighting, except he primarily uses the Blacksky Eye and will heal you with a Choir Bell if you are low on health. If you have the Impurity rune equipped, the Younger Madaras Twin can be summoned near the lantern and Old Hunter Henryk can be summoned on the second floor of the building near the chest. The centipede can be killed by standing behind the stone fence that runs along the back wall of the building to bait its meteor attacks. The meteors won’t hit you, as they’ll be blocked by the fence. Whenever it summons them, its head remains motionless for a long period, allowing you to target it and shoot it, throw projectiles, or Blacksky Eye it once until it readies another meteor. Hardly necessary, considering how easy they are even within melee range, but it’s definitely the safest and fastest method. I got here a completely different way, I went right at the main cathedral and to the small church at the bottom, got almost killed by a giant spider thing I couldn&apos;t see, left there and made my way though the forbidden forest and knocking on one of the doors gave me a stone tongue, I was told to take there, tried the door again got almost eaten again and was taken straight to byrgenworth. Why is this prestigious school so tiny? Were there only, like, three students? the first time I met willem he didnt say anything except uhh ahh, and then even after killing Rom his dialogue remained the same. Why? 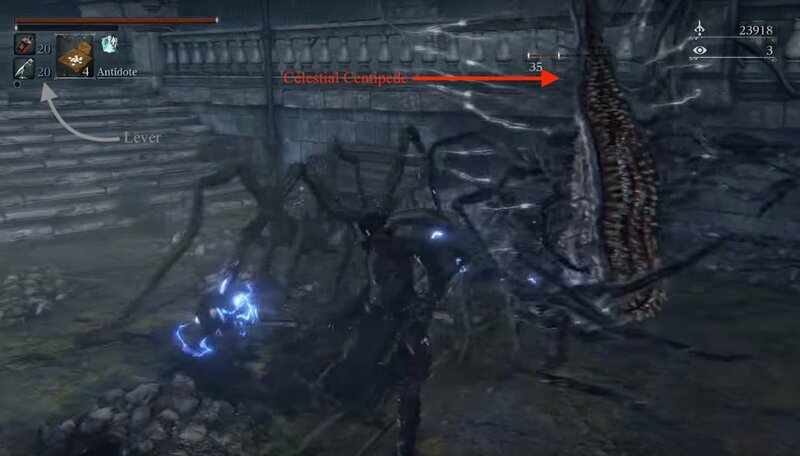 I&apos;ve noticed that when you enter through the door on the right side of the Lunarium (where you first fight the Threaded Cane hunter) immediately to the right there is a trap door similar to the one you go through to get to the Cathedral Ward after beating Father Gasoigne. Could this be a secret room? Any ideas? this freakin hunter keeps killing me with her whip and spray bottle! What happens if I kill this guy? SO when I got to this part Lunarium Key never spawned for me, so I can not fight the boss and progresse through the game, this is unacceptable, and needs a fix now. If you enter the building from the side where the door initialy is open, there is a hatch. But its closed and its similar to the one after oedons grave and in the nightmare school. Is it possible to open it? I noticed that standing before the lunarium door u can head a child crying. And even a woman. Can someone confirm it? I fought the hunter and went to hide under the stairs to avoid her magic, and when she followed me down there she got stuck underneath stairs (her head was clipped into the bottom of the stairs and she was running in place). As long I didn&apos;t stray too far she didn&apos;t bother with her magic attack, so a few big swings of the Hunter&apos;s Axe (two-hander version for the extra range) and she was done. Is it just me or this area failed to deliver? I&apos;ve spent 2 days running around Forbidden Woods, searching for everything while surviving through a dozen of different mobs and fighting a challenging. Then you enter Byrgenwerth, kill 3-4 man-fly, a hunter, find the key to the boss just in the room upstair of the locked door, and Voilà! There must be something else there, it can&apos;t be only a 20 minute walk in the park for such a twist in the story, the night had just gone dark and then boom, another switch without the same feeling of exploration. I&apos;d like to add that when you first enter the building though the door near the gate and turn right, in the corner there is what appears to be a trap door that I couldn&apos;t open. I think it is indeed a trap door because one: it looks like the opened door that you climb up through to enter Oeden chaple after you beat Gasgcoine, and two: when I stand on it, I can&apos;t use any online items. Just to put it out there for anyone who has an idea for how to open it. I managed to kill her like that : Encounter her and run outside. She wont follow you. Come back and she will stand backwards to you, looking at a chest. Sneak behind her and charge your attack. Now run outside until she resets. She wont heal herself. Now repeat until she is dead.